Remember when we cancelled cable? It was the first week of April. Exactly 5 months ago. I had hoped that by canceling cable we’d become overall healthier, happier people. I had visions of sitting around the table playing Dominos as a family. Or solving crossword puzzles together. Mikayla would completely forget about Mickey Mouse Clubhouse. And we’d all watch a lot less tv. I don’t know how its possible, but we actually watched more tv without cable. Mikayla still cries for Mickey’s “Cwubhouse”. And we don’t even own Dominos or crossword puzzles. After 5 months, we still really miss cable. Maybe this tells you the quality of people we are. Maybe this paints us as lazy, good-for-nothin’, tv-holics. So be it. I don’t know if it was missing the first week of football or watching seasons 1 & 2 of Downton Abbey for the 4th time but we finally decided to re-activate our cable. When I talk to people about getting rid of clutter and clearing out the junk, we usually focus on getting rid of the unnecessary stuff – the clutter. But the flip side is determining what things you will keep – things you NEED, things you USE, things you LOVE. You need clothing. Your child uses toys and books and puzzles. You love family photos and heirlooms. Things your family needs, uses or loves should be kept – its not necessarily the same items for every family. Am I saying our family loves cable? Yes. Yes I am. Feel free to judge our shallowness. At least I’m being honest about it, right? I could’ve just re-activated our cable and let you go right on believing we were spending our time working a 10,000 piece Thomas Kinkade puzzle and playing a 3 month long game of Monopoly. I am honored and excited to be guest posting today for my friend Jim Woods at Unknown Jim. Jim has a rare gift for encouraging others. He helps others to find their passion and follow their dreams. He also LOVES chocolate chip cookies. I’d love if you would visit his blog and check out my post there today. If you found me from Jim’s site, thank you so much for stopping by! I write about things I love – books, organizing and adventures of parenting the cutest four year old on the planet...with a little Disney thrown in on occasion. If you’re looking for more organizing tips, please visit my Organizing Tools section above. You can read some of my Favorite Posts or check out Mikayla’s Story to get to know me a bit more. And, I want to hear your story! I’d love to connect with you further. Please share in the comments a bit about who you are, where you’re from and be sure to link to your blog or website! Last week the Disney Parks blog posted three absolutely beautiful images from the New Fantasyland area. The area will open in just a few months and includes two new castles – Prince Eric’s castle from The Little Mermaid and Beast’s castle from Beauty & the Beast. I love how different the two castles look, even though they will be located right next to each other. Belle has always been my favorite Disney princess. 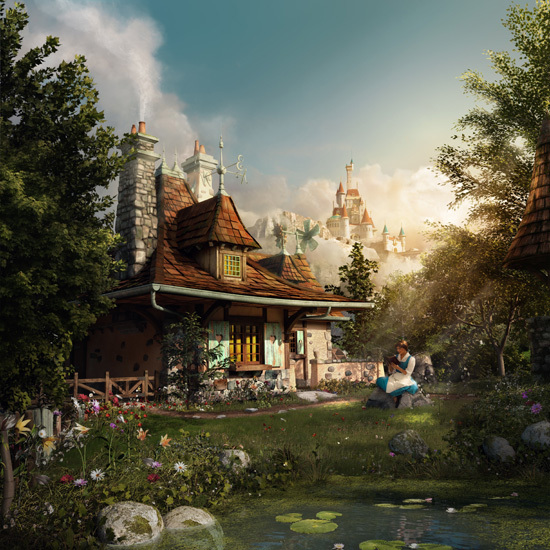 Maybe it’s because she reads or has brown hair...whatever the reason, I wanted to share one of the images of Belle and her cottage. Isn’t it lovely! Be sure to check out the original post to see more. Who’s your favorite Disney princess? Or prince? Or villain? I am honored and excited to be guest posting today for Jeremy Statton at Living Better Stories. Jeremy is truly an inspiration. He and his wife recently returned from China where they adopted two absolutely adorable children. Through his writing, Jeremy encourages others to be inspiring and to live better stories. I’d love if you would visit his blog and check out my post there today. If you found me from Jeremy’s site, thank you so much for stopping by! I write about things I love – books, organizing and adventures of parenting the cutest four year old on the planet...with a little Disney thrown in on occasion. I want to give you permission to do something crazy. Something you might not let yourself do. Something that might be scary and risky. I give you permission to say “no”. Why do we have such a hard time with this teeny, tiny word? You’re asked to volunteer for an event. Your friend asks you to babysit at the last minute. Your child wants something. A family member asks for a favor. And the automatic response is “YES”. Whether we are really able or willing isn’t even considered before that YES escapes our lips. If we aren’t careful, all those yeses add up to an overwhelming schedule. And the first thing to give to make room for all our new responsibility is usually the thing we need most of all. Time for ourselves – to rest and recharge. And then, time with our family is sacrificed as demands on our time increase. Should you always say no when a favor is asked of you? Of course not. There’s a fine line between having a healthy “no” and being selfish. If you are able to help, you should. Just so your helpfulness doesn’t come at the expense of your own health or that of your own family. Opportunities to help should be considered honestly to determine 1) if you have the time and 2) if you are truly qualified for the task. If the answer to both of those questions is “yes” then you can say “yes” to the opportunity and enjoy the feelings of helpfulness and accomplishment. However, if you don’t have time or don’t feel qualified, you shouldn’t automatically say “yes” out of obligation or guilt. Otherwise you’ll be enjoying the feelings of frustration and stress and perhaps even bitterness. If you automatically say yes whenever an opportunity presents itself, you are a slave to your yes. You aren’t choosing to help, you are defaulting to your yes. And those feelings of frustration and bitterness negate any intent of being a loving servant. Practice saying NO so that when you do say yes, you can truly mean it. Your healthy NO gives power to your YES, whenever you choose to use it. Do you have a hard time saying “no” or does that seem to come naturally for you? I’m easily distracted by shiny things. No, no, wait. That’s true, but not what I really want to confess. The truth is, I am easily distracted by online things. Facebook, Twitter, favorite blogs, Twitter again (you know, in case anything new is posted), the Disney blog, checking blog stats, Twitter…again. Whether on my phone or on the computer, I find myself drawn to distractions. Chances are I’m not alone in this. I know in my circle of friends its kind of a running joke that we all have ADD – always checking the iPhones or “multitasking” as we like to call it. And, I know that my writer friends probably struggle as I do to balance working on the computer with playing on the computer. Creative people tend to have several different strands of thought going at all times, dealing with distraction is just part of life. Recognizing my own limitations, I don’t try to completely remove online distractions. Instead I try to minimize them and use them to my advantage. Utilizing a distraction as a reward for work completed allows me to indulge in a bit of social media while ensuring that my work gets done too. One idea to minimize online distractions would be to use a timer. Set it for 30 minutes or an hour then work diligently until the timer goes off. At the ding, take a 10 minute break to browse social media or check your favorite blog. Another option – what I do – is to set a specific goal such as “I will complete one blog post before reading the Disney World blog.” Or whatever grown-up, sophisticated blog you read. If you find you have a hard time sticking to your goals or to the timer, ask a trusted friend to keep you accountable for the time you spend online. Do you struggle with online distractions? What have you done to minimize this?